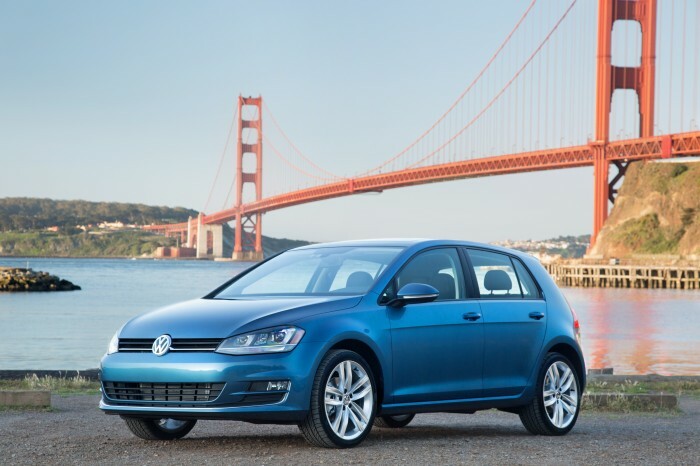 What’s New for the 2015 VW Golf? The 2014 and 2015 VW Golf share a similar exterior style, with the squared off headlights in the 2015 model being the standout feature. Inside the Golf, the center stack is made of better material; there are new air conditioning vents, climate controls, steering wheel, and a more substantial center console. Volkswagen also threw out the 2.5L five cylinder engine for a new 1.8L turbocharged four. The turbodiesel engine went unchanged other than revising some tech to increase power. Technology-wise the 2015 VW Golf has an optional forward-collision warning system, parking sensors, and VW’s Car-Net telematics system. The VW Golf has always stood out from the crowd and Volkswagen isn’t changing that formula. The 2015 model has few differences from the previous model. The most notable changes include squared off headlights and taillights, a slightly different bumper design, and squarer lines around the windows. Under the hood of the 2015 VW Golf are two engines that can rise to any challenge. A new 1.8L turbocharged four cylinder engine pumps out 170 horsepower and torque punches in at 200 lb-ft (compared to 177 lb-ft in the 2014 model). The second engine is the 2L turbodiesel four cylinder that was in the 2014 model. With some updated technology, horsepower increases to 150 horsepower (compared to 140 in the 2014 model) while maintaining 236 lb-ft of torque. With two four cylinder engines under the hood, the Golf can take on long road trips or short commutes. The 1.8L turbocharged four cylinder boasts an improved 25 mpg city/37 mpg highway. The 2L turbodiesel four cylinder also saw an increase in fuel economy as well, 31 mpg city/45 mpg highway. 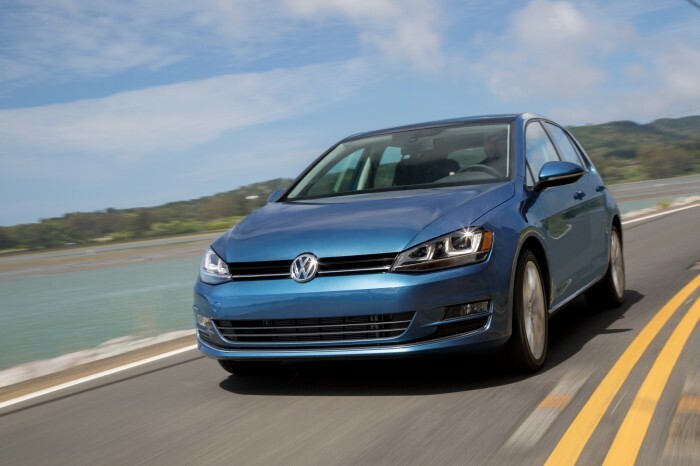 No matter where you’re going, the 2015 VW Golf has both the power and fuel efficiency to get you there. German engineering is at its finest in the 2015 VW Golf. Materials used inside are all about quality rather than quantity while still providing many amenities that aren’t usually found in a hatchback. Inside you’ll enjoy the Fender Premium Audio System, Touchscreen Navigation, and a Panoramic Sunroof as well as the latest technology you’d expect from a Volkswagen, all while sitting on V-Tex leatherette seats. 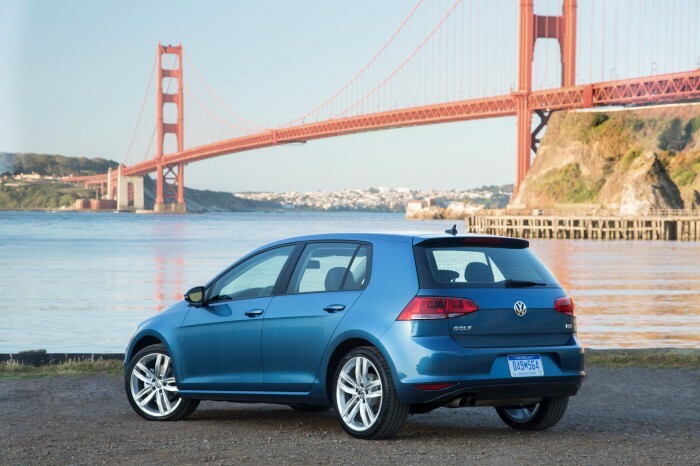 The 2015 VW Golf also boasts 52.7 cubic feet of cargo space, a 30% improvement over the 2014 model. The 2015 VW Golf earned the Institute for Highway Safety’s Top Safety Pick score. It only fell short of the Top Safety Pick+ rating due to a lack of automatic braking in the forward-collision warning system. The Golf carries side and front airbags; anti-lock brakes; an optional rearview camera; forward-collision warning system, and parking sensors. Combine that with seven active stability-enhancing systems, an intelligent crash response system, and a crash optimized from end and you’ll be hard pressed to find a safer hatchback.